These were the invading Albanian muslims of the time only they weren’t pretending to be refugees, they were right up front about what they were doing. Now they are the conquerors who have pretty much completed the ethnic cleansing of their new terrortory (not a misspelling). 6 These are the Muslims the US supported. The US opposed the Christians. This has long been the pattern. December 1941 - Berlin. 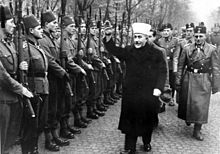 Amin Al Husseini (Grand Mufti of Jerusalem) spent WWII by Hitler's side where he actively encouraged the extermination (the Holocaust) of European (Ashkenazi and Sephardic) Jews. 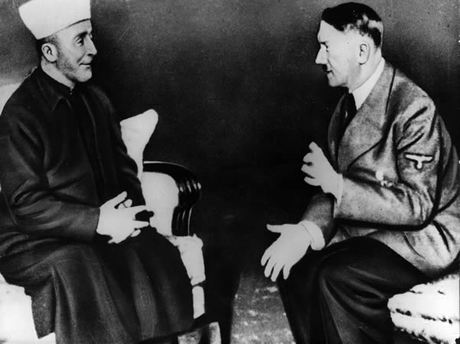 Amin Al Husseini meets Heinrich Himmler, head of the Nazi SS. 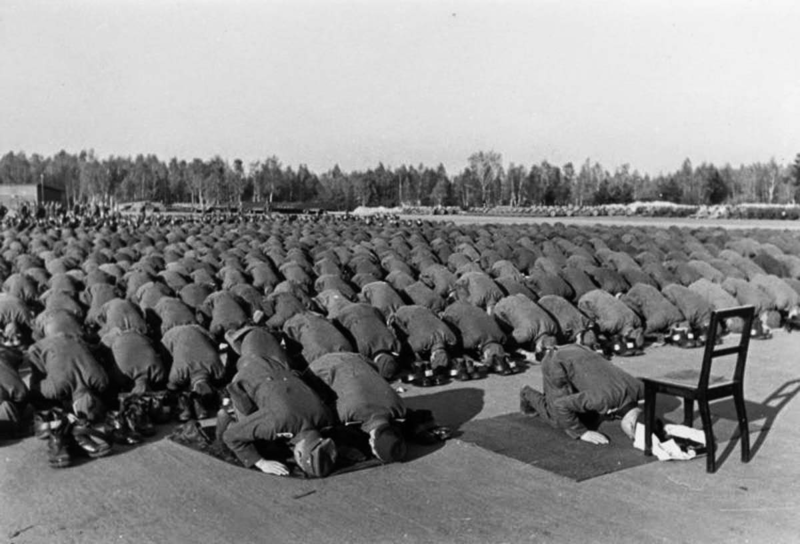 November 1943 - Muslim members of the 13th Waffen Mountain Division of the SS Handschar (1st Croatian) at prayer during their training in Neuhammer, Germany. The 13th Waffen Mountain Division was a mountain infantry division of the Waffen-SS created by the Germans to restore order in Yugoslavia. It was given the title Handschar after a local fighting knife or sword carried by Turkish policemen during the centuries that the region was part of the Ottoman Empire (the division emblem is shown above at right). It was the first non-Germanic Waffen-SS division, and its formation marked the expansion of the Waffen-SS into a multi-ethnic military force. 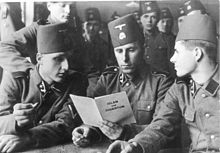 The division was composed mostly of Bosnian Muslims (ethnic Bosniaks) with some Catholic Croat soldiers and mostly German and Yugoslav Volksdeutsche (ethnic German) officers. Amin Al Husseini was the figurehead leader of the Handschar Division. It was Hitler's largest SS Division and was responsible for the genocide of Serbians, Gypsies and Jews within Yugoslavia while fighting the partisans. Its history lies at the root of today's ethnic/religious unrest in Serbia/Bosnia-Hercegovina/Croatia. November 1943 - Amin Al Husseini, alongside SS-Brigadeführer und Generalmajor der Waffen SS Karl-Gustav Sauberzweig, reviewing troops of his Handschar Division with the Nazi salute. Bingo. That was the pro-Muslim, anti-Christian “wag-the-dog” war BillyJeff started to distract from Monica-gate, wasn’t it? It’s had a long term, awful effect on Europe that we are seeing now in the flood of Muslim migrants. And the OP story’s claim that the current “support for Hillary” in that same region, now overrun with Muslims, was organized by anti-racist “activists” is pure-de BS. It’s Soros organized and funded. Isn’t that where they filmed Wag The Dog? How many electoral votes does Bosnia have again? And are they cast as a bloc or split (like the electoral votes in Nebraska and Maine)? In the latter case I don’t think she’ll get many votes from the Republika Srpska. The Asspress bootlickers are shameless. It seems the two partays have something in common, all they care about is power and money.